Delight your guests with party food that’s light, healthy and scrumptious. Accredited Practising Dietitian Anika Rouf shares some ideas. No one ever goes to a party and expects to eat healthy, right? When we think party food, we instantly think of foods like chips, pizza, soft drinks and cakes. But contrary to what you might think, it's very possible to create fine looking party treats that are nutritious at the same time. Hosting a party is no easy task and can come with an enormous amount of pressure, especially if your guests have different dietary requirements and preferences. Here are a handful of healthy party food ideas that will wow your guests. Take the stress out of your day by providing a ‘make it yourself’ station for your guests. 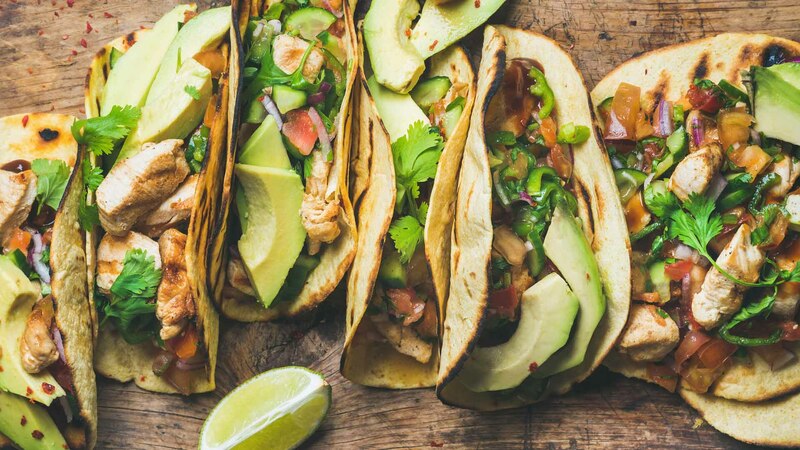 This is where you can set up tacos or wraps and include a variety of different fillings to cater for guests who may have different dietary needs (vegan, vegetarian, gluten free, etc). Not only will it save you time, but it also allows your guests to pick toppings to their own likings. Some vegan options include grated carrots, sliced tomatoes, cucumbers, lettuce, salad leaves, olives, jalapeños, sliced avocado and pickled vegetables. You could also include shredded cheese, sour cream and yoghurt for dairy lovers, and eggs, lean meat and seafood for protein lovers. Sneaking some veggies into your muffins or cakes is a great way to boost the nutritional value. Incorporating veggies will not only help you bulk up your mixture, but also provide you with vitamins, minerals and fibre. Depending on the vegetable, you could either grate it raw or mash it up once steamed. Some vegetables to consider include carrot, zucchini, sweet potato, beetroot and pumpkin. If you wish to use icing, you could use simple ingredients like cream cheese, sugar and lemon. If you're in a hurry, you could always make the icing and serve it in a separate bowl. It will save you time and provide guests the option to ice their own desserts if they wish to. Cut up a variety of fruit into squares (if pieces are not already small, like strawberries). The next step is to work out a pattern to insert the fruits on the skewer. Try to include different colours of the rainbow, but you can use any fruits you like. Some good ideas are strawberries, pineapple, kiwifruit, blueberries, watermelon, rockmelon and grapes. If fresh fruits are not available, you an even use canned varieties as an alternative. Who doesn't love nibbling on nuts and seeds while mingling? There are several varieties of trail mix available at the supermarket, but you can also make your own by purchasing the ingredients separately and mixing it up. Creating your own mixture gives you better control of the ingredients that go in. You could include almonds, walnuts, peanuts, macadamias, cashews, pepitas, sunflower seeds sultanas, dried cranberries, dried apricots and chocolate chips – the options are endless! A party is no fun without a little chocolate! All you have to do is heat up chocolate blocks that are suitable for melting (dark, milk or white). The next step is to chop your fruits up into bite-sized pieces. Strawberries are a great choice as they are commonly used with chocolate. However, if they are not in season, some other options include bananas, pineapple, mandarin segments and grapes. Once the chocolate is hot, dip your fruit in heated chocolate and place in the fridge to set for a couple of hours. Anika Rouf is an Accredited Practising Dietitian and PhD Candidate. Her area of research investigates social media use to improve eating habits of young adults.